Happy first Friday in March! I'm glad that we are heading closer to springtime. I can't wait to see the pretty colors of the flowers in our neighborhood and a bit of warmer weather hopefully heading our way. Thanks for joining us for a new week of our link party - The Ultimate Pinterest Party! It's always fun to see what new items bloggers will link up. It's great for getting ideas for new crafts, recipes to try, and useful tips. Hope you find something that is just right for you! 4 Reasons Why You Should Refuse To Cosign from Unshakeable Joy had 14 re-pins from last week's party. Lavender Orange Marmalade from That Recipe. What a nice combination of flavors. 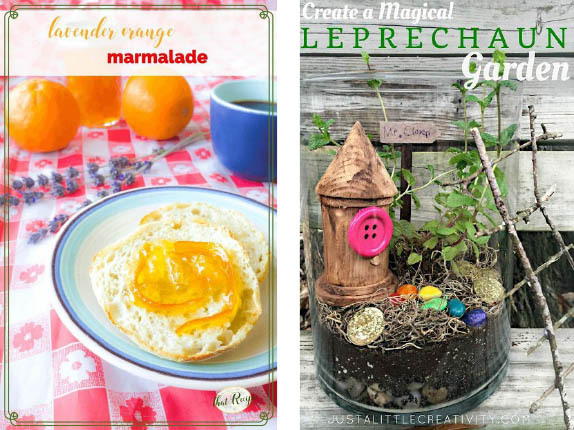 Create a Magical Leprechaun Garden from Just A Little Creativity. This would be such a fun project! At first I didn't really like pinterest, I've grown to actually really enjoy it (and use it everyday). These links are awesome and a great way to keep me motivated on trying new things!